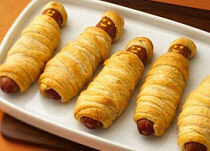 Cook up a spooky feast for all the family this halloween with a range of deliciously creepy goodies. Scroll down for all the gory details. 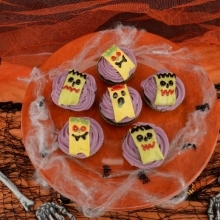 The perfect treat for Halloween parties, these delicious cupcakes will scare as you share them! 1. Whisk the sugar and butter together in a bowl for 2 minutes. 2. Add the eggs and whisk for 2 minutes. 3. Sieve the flour and cocoa power and fold into the mixture. 4. Divide the mix into 8 cases in a cupcake tin. 5. Bake at 180C (Fan 160C) for 15 minutes. 1. 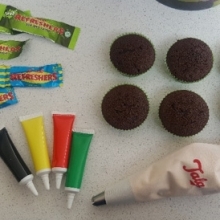 Mix the butter and icing sugar until smooth then add a small amount of food colouring to achieve the desired colour. 2. 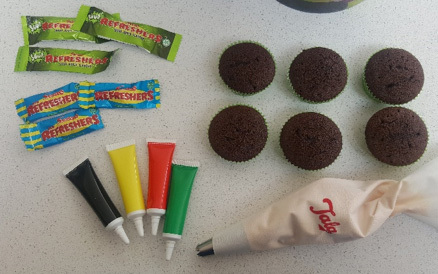 Put into an icing bag and pipe onto cakes, alternatively spread with a knife. 3. 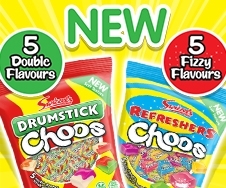 Unwrap Lemon Refreshers and Sour Apple Refreshers. 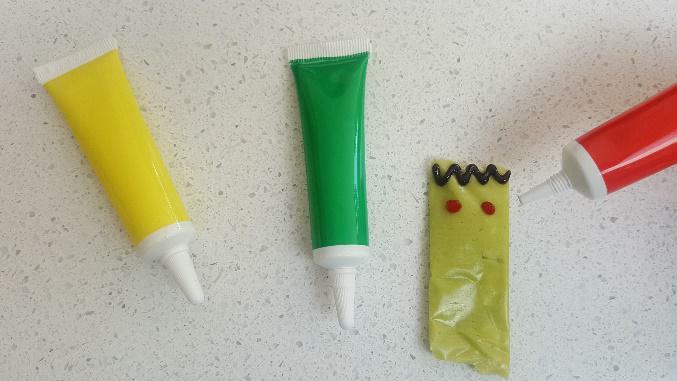 Use the icing pens to create monster faces. 4. 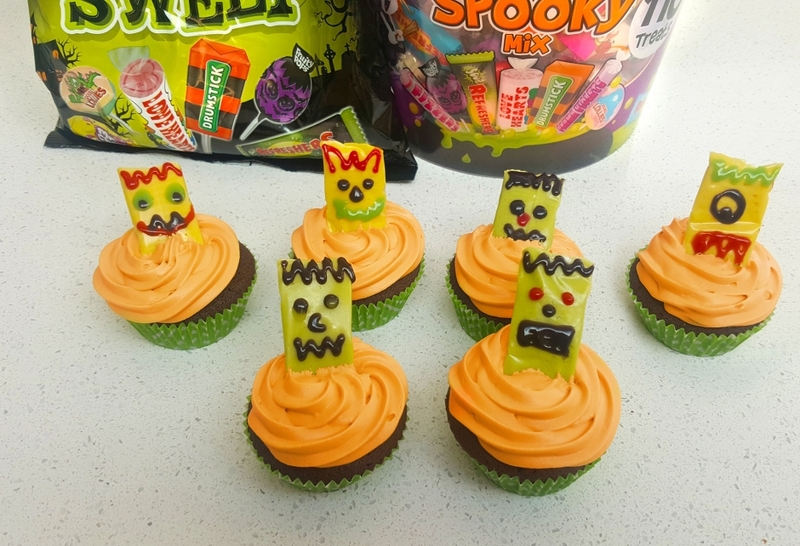 Add the monster to the cakes just before serving! Want to get into the Halloween spirit but a bit short on time? 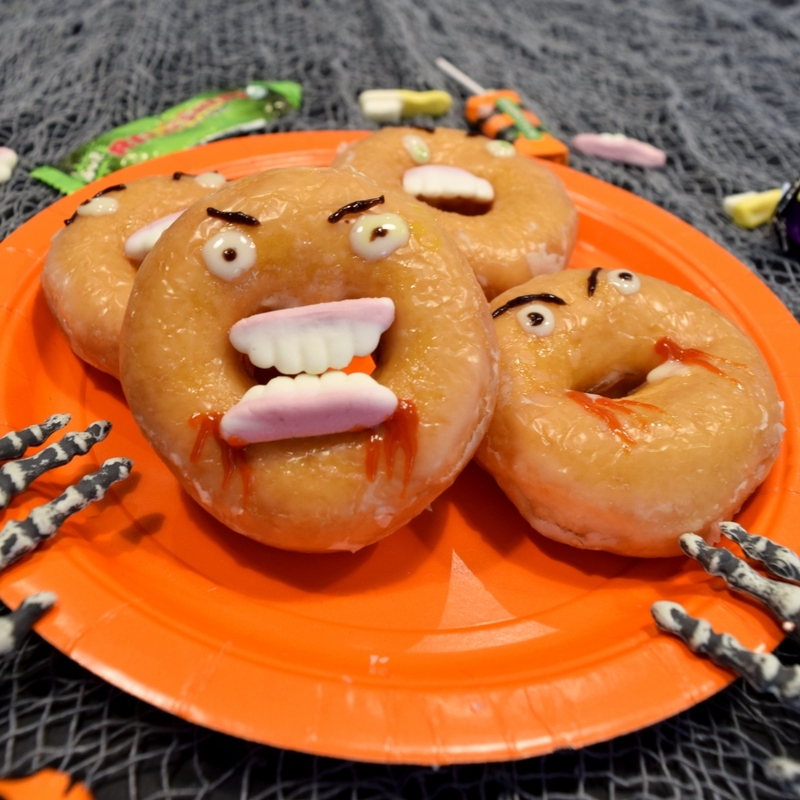 We’re here to help with these monster doughnuts that only take 10 minutes! Doughnuts, as many as you need whether that be a treat for the family or enough to entertain! Swizzels Fun Gums Teeth and Toothbrushes, for those terrifying teeth. Icing. The colours are up to you, but we suggest white plus one other colour for the eyes and red for the blood. We also used black for some angry eyebrows. Squeeze two blobs of white icing onto your doughnuts for eyes. Add two lines for eyebrows if you so wish. Let the white set slightly before adding two smaller dots onto the white blobs for the pupils. 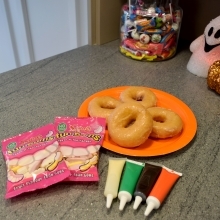 Take your Fun Gums teeth and squeeze a line of white icing onto the underneath of the gum. 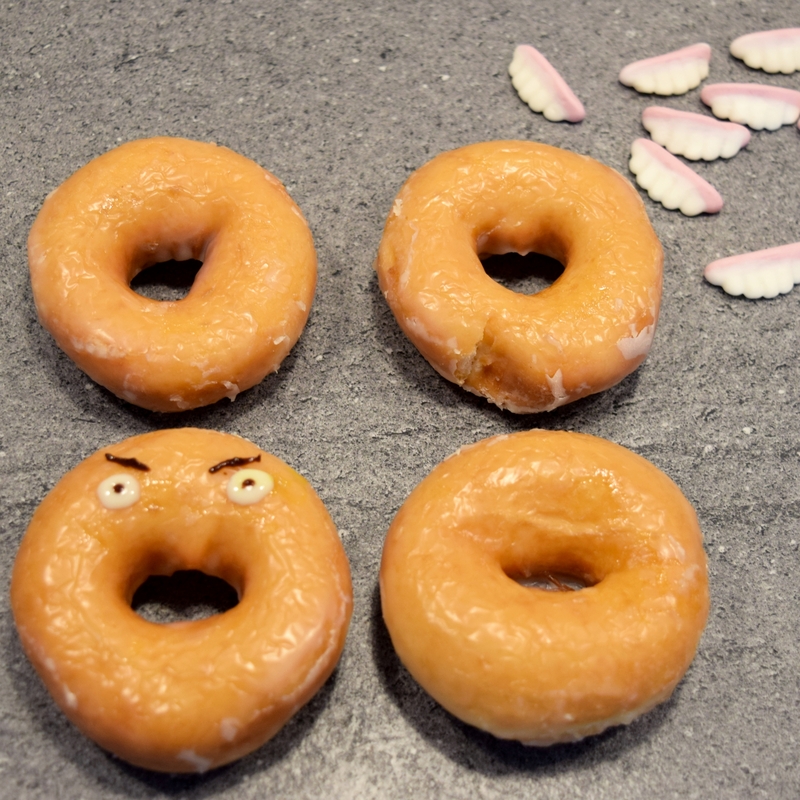 This is to help them stick to your doughnut. 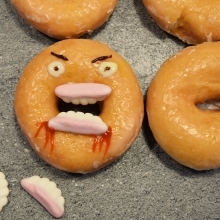 Position the teeth on the doughnut and hold for a few seconds to stick. Now for the final, spooky touch! 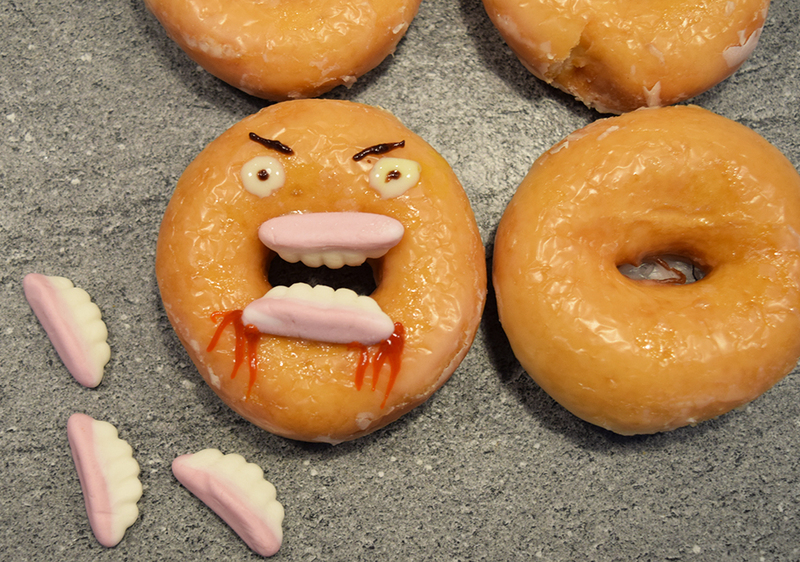 Draw a blob of red icing at the edge of the teeth and drag the excess icing downwards to create a dripping blood effect. Get creative with other designs such as adding fangs, or changing the eyebrow shape for different facial expressions! 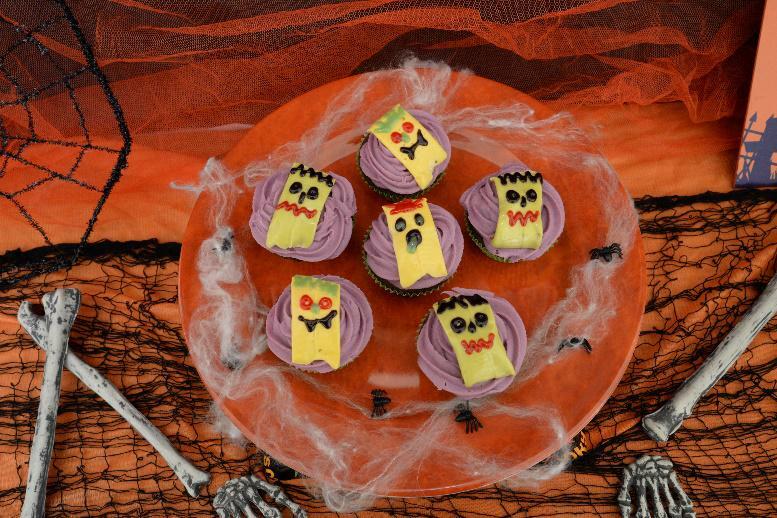 With only three ingredients needed, we hope you enjoy making these sweet treats! Use a paring knife (parents only) to cut each string in half and then carve a shallow area for a fingernail just below the rounded end of each half. Heat the oven to 350°F. 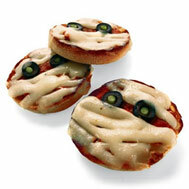 For each mummy, spread a tablespoon of pizza sauce onto half of an English muffin (toast it first, if you like). 1 pack of ready rolled puff pastry (available in the chilled aisle of most supermarkets). 1 12-pack of hot dogs. Fold out the puff pastry and cut into 1cm slices. Brown or black decorating gel. Using the whisk attachment and an electric mixer, beat the egg whites on high speed until soft peaks just start to form, about 1 1/2 to 2 minutes. Add the sugar in a slow, steady stream and continue beating on high speed until very stiff peaks form, about 2 to 2 1/2 minutes more. Scoop out large spoonfuls of the whipped egg whites and place them a few inches apart on the cookie sheet, using your fingers to shape the mounds like ghosts. Turn off the oven and place the meringues in the oven to dry, at least 6 hours or overnight. 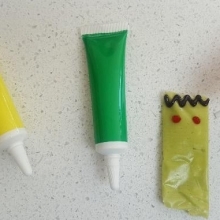 Remove the meringues from the oven and draw on eyes with the decorating gel. A large serving tray or cutting board. 1 large bag of baby carrots. 1 carton of your favourite veggie dip. 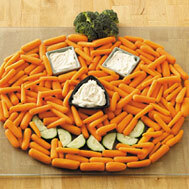 Place halved cucumber slices in the space you created for your carrot pumpkin’s smile. Fill your ramekins with the veggie dip and shimmy them into place where you want the pumpkin’s eyes and nose to be. Unwrap the packet of refrigerated puff pastry and separate into rectangular pieces. Working with one piece at a time, stretch the dough to lengthen it a bit and then use kitchen scissors or a knife to cut a 11/2-inch slit in the centre of each end. 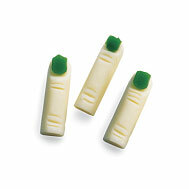 Roll or shape the resulting four flaps of dough into knobs that look like the ends of a bone. 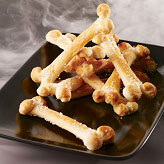 Place the dough bones on an ungreased baking sheet, spacing them a few inches apart, and sprinkle on a little coarse salt. Bake the bones until they are light golden brown, about 12 minutes. Serve with a dip such as humus with red food colouring to resemble blood.